Jam Filled Butter Cookies are a really tasty treat. 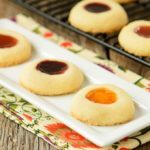 You can make them with your favorite flavor of jam or preserves or a variety to please a crowd. Preheat oven to 400°F. Line baking sheets with parchment paper or non-stick liner. Add vanilla and almond extracts and beat to combine. Add flour and mix until combined (dough will look crumbly). Shape dough into 1-inch balls and place balls on baking sheets. Flatten cookies slightly and indent centers. Fill centers with jam or preserves.